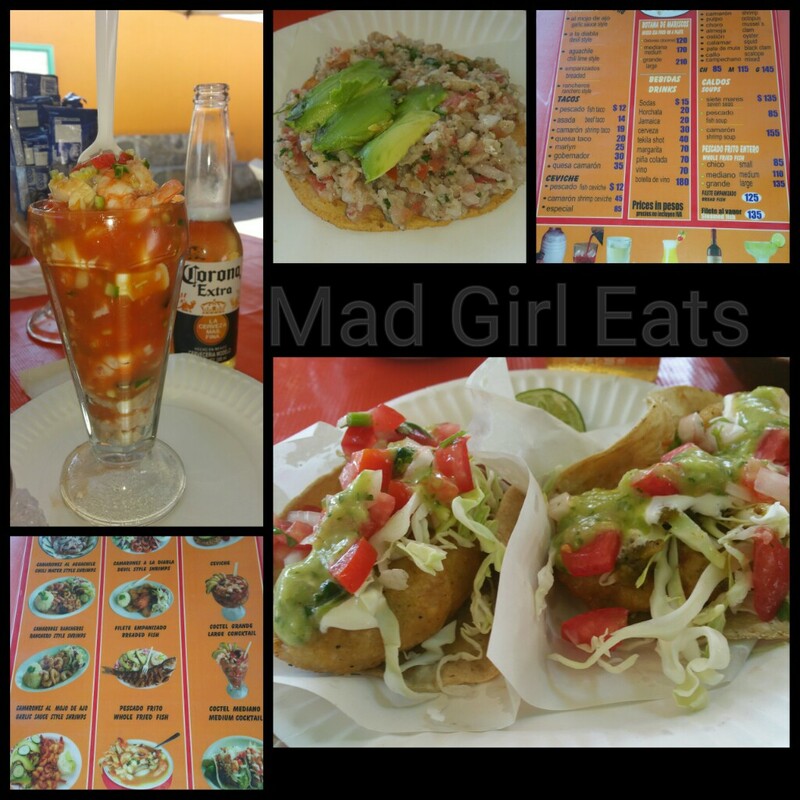 Mad Girl Eats Fish Tacos in Ensenada Mexico! The Ensenada open air Fish Market is at the seaport/marina on the main coastal highway, Federal Hwy 1. Downtown is directly across the street. Ensenada = fish tacos. The home of the fish taco, the first, the best. Strolling past the myriads of open-air restaurants along the seaport fish market, they all look similar and have boisterous greeters to reign you in. Chef Rick Bayless was here and had me intrigued to return! Let’s eat! Fresh seafood, beautiful dishes, so much to choose from! Fish tacos, of course, ceviche, and shrimp cocktail washed down with a Corona and life is good. Delectable lightly batterfried fish with fresh cabbage on homemade corn tortillas, just add the abundant choices of salsa and crema placed on the table with a squirt of lime, and you’re ready to rock n roll. The ceviche was placed on a tostada topped with sliced avocado. Oh so amazing. The shrimp cocktail had generous amounts of shrimp, fish, and octopus! It doesn’t get better than that! Absolutely delicious, fresh, clean, amazing food. I wish I lived closer! Check out the Fish Market restaurants at the port, or across the street on many corners of downtown. Peruse the fish market itself while there, you’ll appreciate it if you’re a Foodie. It was my first encounter with Geoduck (Gooey duck) beside what I’ve witnessed on Chopped! Interesting. 5 out of 5, fresh and freakin’ awesome food! Bonefish Grill, 7830 Sand Lake Rd., Orlando, FL. Many locations. I have a penchant for fish tacos, although, I’m hard pressed to find extraordinary ones outside of Ensenada, Mexico…or the San Diego area. 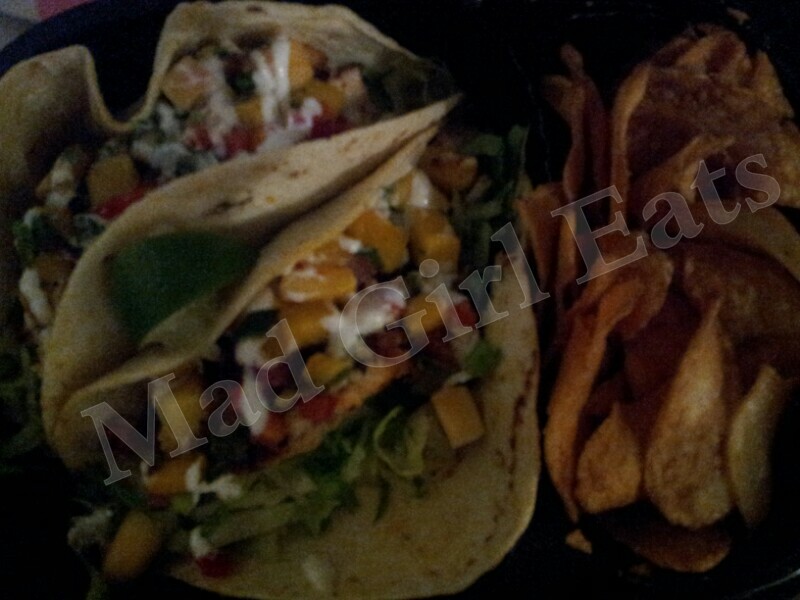 Because I am not a quitter, I jumped at the sight of the Baja Fish Tacos offered at Bonefish Grill. I prefer batterfried fish, but this time the word ‘Cajun’ popped up and knew I had to try. The fish was cooked Cajun-style and wood grilled. The two tacos were made of delicate, soft corn tortillas, with lettuce, mango salsa (swooning), and sour cream drizzle atop of the flawlessly seasoned fish….finished with a perfect squeeze of fresh lime. A healthy choice with abundant flavor. I liked the bit of kick from the Cajun spice, it woke up the fish and was a primo balance with the mango salsa. Dip me head-to-toe in that mango salsa, it’s just that flipping good! The plate also came with homemade kettle potato chips. Ummmm, yum. I love the heavy alto crunch they give without sounding like you’re breaking a tooth. The amount of calories and fat grams I saved from the tacos, went directly to the chips….and most likely to my hips. Take a walk, it evens out. Dynamite delights from Bonefish Grill. 4.75 out of 5 Arriba Arriba….pure happiness!